While on their way to St. Petersburg, FL for a performance on this U.S. tour, Adrenaline Mob were involved in an automotive accident that cost bassist David Zablidowsky his life. The accident happened just off I-75 when a tractor-trailer slammed into the band’s RV, which was parked on the side of the interstate. 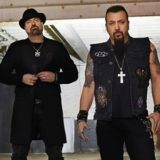 Former Adrenaline Mob bassist John Moyer (Disturbed) and ex-drummer Mike Portnoy have commented on the tragic news.